Times were hard in the late 1800’s in Arkansas, especially for an Iowa immigrant and his family. Perhaps a fresh start would be best. 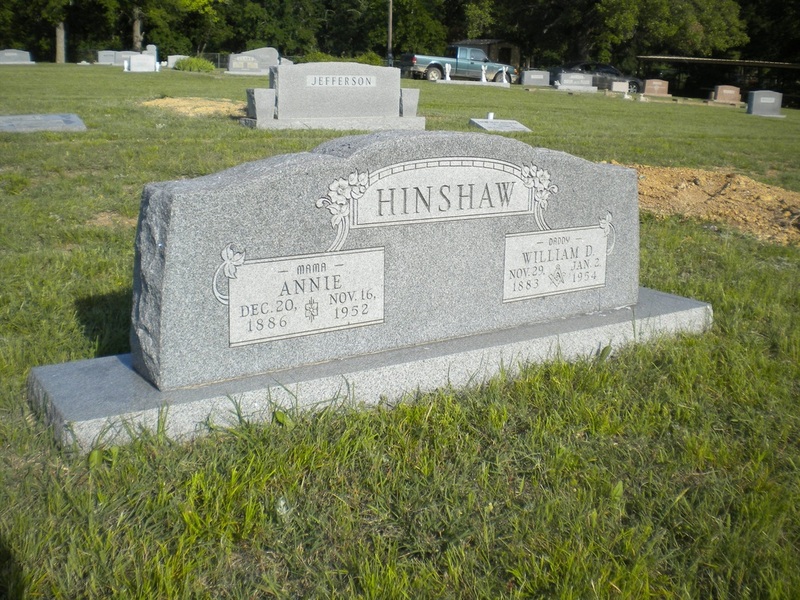 So Thomas Hinshaw packed his wife, Eleanora and the children – Ada, Mary, William David (Bill) – in the wagon and moved west, settling in Northeastern Parker County near Veal Station. Thomas and his family built a new life. This new life was not without grief. Eleanora died June 10, 1896, at the age of 47; and Mary died November 24, 1902, shortly before her sixteenth birthday. Mary, her mother, and father are buried in the Azle cemetery. Ada and Bill grew up and married. Ada married Dave Hayes. 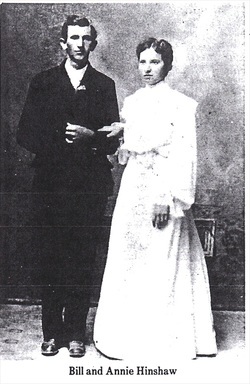 Bill married a native Parker County lass, Annie Barker, on October 12, 1904. They were married in a cotton patch where they found the preacher picking cotton. Annie was the youngest of twelve children born to James Jasper and Ann (Veach) Barker. Her brother, Barney, served several years as sheriff of Parker County. Thomas came to live with Bill and Annie until his death on February 2, 1908, at the age of 67. Bill and Annie’s children fondly recall a pair of mules that Bill received as his inheritance at the death of his father. Bill and Annie lived several years in the Veal Station area where three children were born to them – Jim in 1905, Ellen in 1910, Ozella in 1913. After moves to Millsap, Weatherford and Oklahoma, where Lawrence was born in 1919, Bill and Annie settled on a farm near Whitt. Farming and cattle raising kept the family busy. Here Winston (1923), Dorothy (1928), and David (1930) were born. The family reminisces about memorable times along Rock Creek hunting squirrels, hoeing tomatoes, gathering watermelons, trading cattle, walking to Oxford Sunday School, and generally growing up with laughter and hard work. As the years passed the children left home. Jim moved to West Texas where he met and married Edna Farmer. Shortly after their marriage Jim and Edna moved to Sterling City where Jim managed the J. T. Davis ranch for over 50 years. They had one daughter, Peggy, who now lives in California. Jim died February 2, 1979, seventy one years after the death of his grandfather, Thomas. Ozella married Ertis Sears in 1931. They had three sons – Bill, Fred, and John. Both Fred and John are Parker County residents now. Bill lives in Abilene. After Ertis’s death in 1966, Ozella later married Sid Barham. Today they reside at 103 E. Second in Weatherford. Both, Ozella and Sid, have retired from working and teaching in the WISD for several years. Ellen married Grundy Walker in 1935. They had two children – Ann and Delbert. Ann (Turner) now resides in the Whitt area, and Delbert lives in Fort Smith, Arkansas. Ellen, now widowed, lives in Mineral Wells. Lawrence left home to fight with the Allied forces in World War II. He was killed in North Africa in 1944. He is buried in the National Cemetery at San Antonio. Winston “Short” served in World War II in the Pacific area. After the war ended he returned and married Tillie Pemberton in 1947. They have two daughters – Nita and Penny. Nita (Harrell) is now a resident of Artesia, New Mexico; and Penny (Tressler) resides in Little Rock, Arkansas. Today Short and Tillie live just north of Weatherford. Tillie is a WISD teacher where she taught for 21 years. Dorothy married Charles Schindler in 1958. They have three daughters – Kay, Bea, and Becky. Kay is a resident of Fort Worth. Dorothy, Charles, Bea and Becky now live north of Mineral Wells. David served in the Korean War, after which he married Elfrieda Brocker in 1956. They have two children – David and Frana. David and his family now reside in Weatherford. David is presently the maintenance supervisor for the State Department of Highways and Public Transportation of Parker County. Bill and Annie moved from Parker County in 1945 to Palo Pinto County. Annie died in 1952 and Bill in 1953. Both are buried in the Clark Cemetery near where they began their life together.